Still using this one for Spring. Love it and fits great and is comfortable and bright! Drench your bedroom space in the 'Mona' coverlet set, for a uniquely modern bohemian look. This charming pattern features floral medallions and bird motifs in a mirror layout with bright shades of yellow, orange, and teal for a beautiful update to your space. Two decorative pillows use coordinating colors to pull this look together. This coverlet set is white, golden yellow, burnt orange, sea foam green, dark teal, a taupe grey and white. Very vibrant and happy. I could have done without the throw Pillows as they feel like an afterthought but the actual coverlet and pillow shams are good quality and look very nice. The colors are just like the picture shows, very bright with a nice white background. I bought this for my full bed in the guest room and it fits perfectly. I was worried that this coverlet wouldn't be thick enough, but it's the perfect thickness-not too thick, not too thin. I would definitely recommend this bedding set. Very beautiful and cheerful quilt set. Well made and good quality. I just wish the pillow shams had bigger rims and the decorative pillows were a little bigger. This is SUCH a bright pattern and I LOVE it. It's exactly what I wanted in my little studio apartment. It brightens the place up, and the colors are very, very vibrant, especially the yellow. It has a very Bohemian feel to the design but is understated enough that you can dress it down, or you can dress it up with fun throw pillows. The decorative pillows that came with this set are very, very pretty; the yellow rectangular one has cute frills, and the stitching on the square pillow is just GORGEOUS. I would absolutely buy this again, and might have to buy a couple other coverlet sets from this brand just to mix things up. This coverlet set is beautiful. I love the colors especially the yellow. The material is nice and soft. This coverlet is adorable! And colorful! And the matching pieces are an added bonus. Great for a guest room. A little thin, but perfect for freshening up the room. Fun! The colors are as pictured. For me, the colors are just too bright and vibrant. 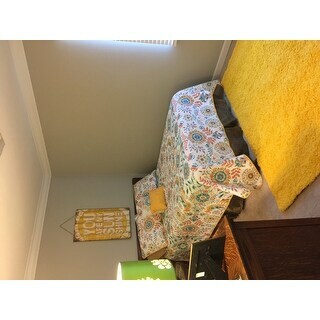 The quality of the quilt and pillows is nice, however, and I would recommend if you are looking for a bright yellow. I bought this to add some color to my guest room. I absolutely love this too... The coverlet is beautiful and well made and it certainly brightens up the space. I definitely recommend this if you're looking for a pop. Nicely, you can also use the solid side if you want a change, and it mixes beautifully with other similar colored accents and a white quilt. 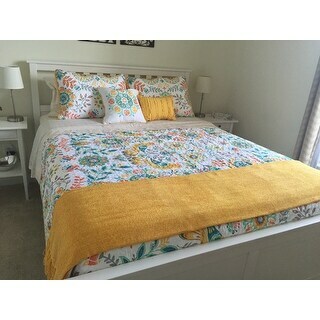 Recently redid our bedroom and ordered this quilt set. The colors are bright but look perfect against our soft grey walls. It's been easy to coordinate art and accessories with it. Bright and cheery describes this quilt. Good quality and very pretty! Gorgeous, springlike and colorful! Perfect quilt set! Love the shams and colors. Fit my full size bed perfectly. Great change from my gorgeous cream winter bedding. Very pretty colors and design that will be perfect to transform my guest bedroom for spring. I recommend this for anyone looking to brighten up a dark bedroom. It is also great for a girl's bedroom. It is lightweight and perfect for warmer weather. Absolutely love this set! Always makes me smile when I enter my bedroom! This is so cheery and bright like a summer day! I will definitely refer all of my friends to this site. "Does it come in a king?" No, this is not available in King. "Is it reversible so it can be used on the yellow side?" Yes, the reverse is yellow and can be used. I am happy I bought this Coverlet. "what does the reverse side of the quilt look like? is there a difference pattern?" The reverse is a solid yellow color. "Does this come in full/queen size?" We ordered it in a queen back at Christmas time. Maybe it is just currently out of stock. There is Full/Queen size. If you don’t see it, it may be temporarily out of stock. They will be in stock middle of June. "is there red or pink in this quilt? It looks pink on the computer monitor"
It's more of a salmon color. No red or pink. What may appear as such is the color orange. "How thick is this? Is it about as thick as a normal quilt?" It's vibrant colors!!! Great price!! Perfect blend of colors for my beach house. Wanted something fresh for my guest room. Colors look perfect.